Odontofroggatia Ishii 1934. Type species: Odontofroggatia gajimaru Ishii 1934. 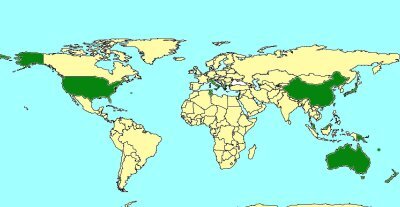 Indo-Australian region: Australia, Bermuda, China, Japan, Malaysia, New Zealand, Papa New Guinea, Taiwan. Holarctic region: Greece, Israel, Italy, Tunisia, U.S.A., U.S.A.-Hawaii. Oceanic: Solomon Islands. Host figs: Ficus microcarpa and F. prasinicarpa. Feng, G. & Huang, D.-W. 2010. Description of a new species of Odontofroggatia (Chalcidoidea, Epichrysomallinae) associated with Ficus microcarpa (Moraceae) with a key to species of the genus. Zootaxa 2335: 40–48. Wiebes J.T. 1980. 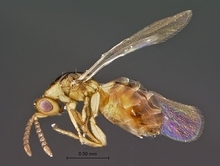 The genus Odontofroggatia Ishii (Hymenoptera Chalcidoidea, Pteromalidae Epichrysomallinae). Zoologische Mededelingen Leiden, 56: 1-6. Photographs © Simon van Noort (Iziko Museums of South Africa) or Gui Feng (Key Laboratory of the Zoological Systematics and Evolution, Institute of Zoology, Chinese Academy of Sciences, Beijing, 100101, China).